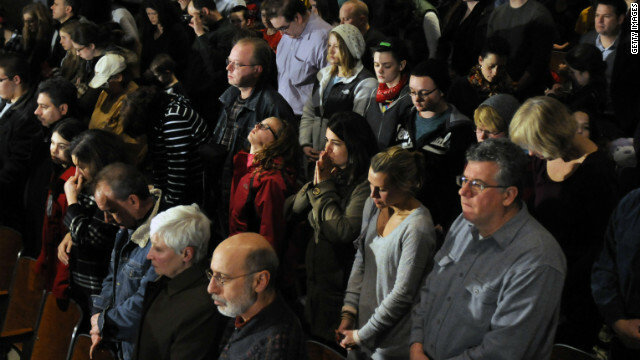 People pray at the interfaith vigil in honor of the victims of the Sandy Hook Elementary School shooting in Newtown, Connecticut. Washington (CNN) – A Lutheran pastor has apologized after being chastised by his denomination's leader for offering a prayer at an interfaith vigil for the victims of the school shooting in Newtown, Connecticut. Pastor Rob Morris, who leads the Christ the King Lutheran Church in Newtown, violated the Lutheran Church-Missouri Synod's rule against taking part in joint worship services, said the synod's president, Pastor Matthew C. Harrison. Participation could be seen as endorsing "false teaching" because some among the diverse group of religious leaders at the vigil hold beliefs different from those of synod. The vigil, which was attended by President Barack Obama, was a high-profile part of the healing process for the families of the 20 children and six adults killed at Sandy Hook Elementary School on December 14. One of the victims of the shooting was a young congregant of Morris' church. In an open letter posted online, Harrison wrote that because of "the presence of prayers and religious readings" and the fact that "other clergy were vested for their participation," the event was a "joint worship with other religions." "I could draw no conclusion other than that this was a step beyond the bounds of practice allowed by the Scriptures," Harrison wrote. "There is sometimes a real tension between wanting to bear witness to Christ and at the same time avoiding situations which may give the impression that our differences with respect to who God is, who Jesus is, how he deals with us, and how we get to heaven, really don't matter in the end." Harrison then "asked Pastor Morris to apologize for taking part in the service" because he "violated the limits set by Scripture regarding joint worship" and "gave offense" to the Lutheran leadership. A day after Harrison's letter was posted, Morris apologized in another open letter. "To those who believe that I have endorsed false teaching, I assure you that was not my intent, and I give you my unreserved apologies," Morris wrote in a letter to the Lutheran leadership. "I apologize where I have caused offense by pushing Christian freedom too far, and I request you charitably receive my apology." In the same letter, however, Morris defends his decision to participate, writing that he believed his participation was "not an act of joint worship, but an act of community chaplaincy." "Those who have followed the news reports are aware that this event is not quite like anything that has happened before," Morris wrote. "I believe (and I fervently pray) that my ministry will never involve a parallel situation to the one that faced my congregation and community that weekend." According to the Lutheran Church-Missouri Synod, participating in joint worship events, particularly with religions that "reject Jesus," is forbidden and violated the synod's constitution. In his letter, Harrison cited Romans 16:17 as the justification for this rule. "I urge you, brothers, to watch out for those who cause divisions and put obstacles in your way that are contrary to the teaching you have learned," the passage reads. "Keep away from them." Morris is not the first Lutheran pastor to be reprimanded for participating in an interfaith event. After the terrorist attacks of September 11, 2011, a New York pastor was suspended for participating in a similar interfaith event memorializing those killed in attack on the World Trade Center. You must take component in a contest for one of the top blogs on the internet. I will advise this web-site! Wow. I'm sure that Synod decision made Jesus proud. "Accept him whose faith is weak, without passing judgment on disputable matters. One man's faith allows him to eat everything, but another man, whose faith is weak, eats only vegetables. The man who eats everything must not look down on him who does not, and the man who does not eat everything must not condemn the man who does, for God has accepted him. Who are you to judge someone else's servant? To his own master he stands or falls. And he will stand, for The Lord is able to make him stand." "One man considers one day more sacred than another; another man considers every day alike. Each one should be fully convinced in his own mind. He who regards one day as special, does so to the Lord. He who eats meat, eats to The Lord, for he gives thanks to God; and he who abstains, does so to The Lord and gives thanks to God. For none of us lives to himself alone and none of us dies to himself alone. If we live, we live to the Lord; and if we die, we die to The Lord. So, whether we live or die, we belong to the Lord." "For this very reason, Christ died and returned to life so that He might be The Lord of both the dead and the living. You, then, why do you judge your brother? Or why do you look down on your brother? For we will all stand before God's judgment seat. It is written: "'As surely as I live,' says The Lord, 'every knee will bow before Me; every tongue will confess to God.'" Doesn't say anythiing in there anywhere about the Lutherans being the one true church! Or the Catholics, Protestants, Jews or Muslims, et.al., for that matter. It just says don't judge how your "brother" expresses his faith. We can all learn from that! Amazingly sad. Is the lutheran church really that myopic and obtuse? This is why I put my faith in the Great Out Doors to relieve my burdens and raise my spirits. My G.O.D. would never conceive of placing boundaries on my goodwill and community support. Hard to say. The Diverse Beast is callin' the shots with religion in americult these days. It's in charge of everything, like a god. I think everyone should read this passage and come away with what their own understanding is, not what someone else tells you what it means. Seems to me that this "synod" is exasperating "divisions" in the church. Thus the crux of satanical power presides over the "Church" detracting from its true purpose and leading us to fight amongst ourselves. Christianity is about the belief in and faith in Christ not about religious dogmas. For ALL have sinned and ALL have fallen short of the Glory of GOD. That the entrance to heaven be not attained through works and deeds but through faith in Christ the savior. Inter faith worship is the best way to express God's love – this heretical sect is not practicing Christianity and I'm sure they don't believe in military chaplians either. What a shame. Inter faith orgiés are the best way to express God's love. I must have missed it, but what terorist attackes happened on 9/11/2011? Are you stinking kidding me? If I was the pastor, I'd resign my membership in the Synod and find a Lutheran church not affiliated with the Synod. What a crock. I believe it is this type of thinking that makes non-Christians hate Christians. The man lost a member of his own church, and he was not allowed to pray? Cut me a break! Athiests are always just as funny as they think they are and are never obnoxious hahahahahahahahaha! It has always fascinated me how this religion of love and peace will only dole it out IF it is the only religion allowed to. Hypocritical. If there was a god, he would be shaking his head. Remember that this is Missouri-Synod. Not Evangelical Lutheran Church in America (ELCA)!!! He broke no law of God. Just mans law. Shame, he was doing the right thing. Thank you, very important clarification. This is not coming from ELCA!! Then he should resign from the Synod he's in and join the other instead. This makes all Lutherans look bad. Perhaps this Synod should be removed from America, where all faiths are considered equal. A Christian that doesn't understand forgiveness, now that's hysterical! Cute. Do they ask him today all the prayers backwards while pacing in a sacred circle widdershins to "erase" them? Oh that's just bad....no wonder I'm not Lutheran....sad sad sad, the divisive line drawn in the sand while people hurt and needed comforting by all faiths. I'm sorry, but these Christian elitist churches need to learn a lesson in humility! May this be it! What could be more arrogant than claiming to know what god wants? The reasons religions don't want their members to take part in interfaith services is not that they might say the wrong prayer (which is a terrible sin, I guess) is that they don't want to lose members. "What could be more arrogant than claiming to know what god wants? " Claiming to know god exists. Claiming to know god exists.....OR....claiming to have so complete an understanding of all space, time, and sentience that you've proved the non existence of ANYTHING. Oh wait, I forgot, because an atheist can say something makes it true because an infinite number of universes exist making it 100% probable that anything you say is fact, or...whatevr it is they said on NOVA yesterday. Had there been no backlash of bad publicity, there would have been no "apology". I hope it was a public apology, but knowing the misery synod as well as I do (grew up in it, confirmed, etc), I know they didn't. We are all children of God, and the misery synod desperately needs to come into the 21st century. It's not as if the Missouri-Synod hasn't done anything like this before. By its very nature, it chooses to force its members to shun other religions. All Lutherans should rise up and vote this Synod out of existence. Let the Evangelical Synod represent the flock. This is just terrible.